The four finalist names made it through to the second last stage of the initiative to designate SEAT’s large SUV, the third one following the Ateca and the Arona. This phase required the brand to organise several focus groups in its main markets, as well as testing in the countries where the company operates in order to select the four finalist names among the nine previously shortlisted. 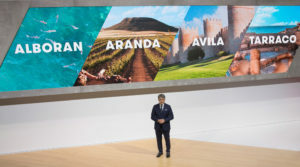 Speaking about the four candidate names and the excellent response obtained by the initiative, SEAT President Luca de Meo pointed out during his presentation at the Frankfurt Motor Show that: “Alboran, Aranda, Avila and Tarraco meet all the necessary requirements for becoming another one of SEAT’s emblems. The project has been a clear success and we would again like to thank all of the more than 133,000 fans in 106 countries who collaborated on the initiative. All that remains now is the final stage, and we encourage everyone to participate in the vote”. Alboran – the Alboran Sea is the westernmost portion of the Mediterranean Sea. A major driver of the western Mediterranean water cycle, it is home to the greatest diversity of species in the seas of Europe. Aranda – a city of more than 32,000 inhabitants in the province of Burgos, located in the region of Castile and Leon, it is the capital of the Ribera del Duero county, famous for its production of wine. Avila – a city in the region of Castile and Leon, at 1,131 metres above sea level it is the highest provincial capital in Spain. The wall surrounding the old town is a symbol of the city. Tarraco – it is the name of the former Roman city, one of the most important of ancient Hispania, which today is Tarragona. Its archaeological remains received the UNESCO World Heritage designation in 2000. The initiative #SEATseekingName, launched last June, received a total of 133,332 proposals from SEAT fans in 106 countries, who put forward 10,130 different Spanish place names following the guidelines defined by the brand. The selection continued through a strict process involving linguistic and legal criteria, as well as ensuring that the names matched the brand values and the product characteristics of SEAT’s new SUV.